Adding a puppy to your life is a major new adventure, and an opportunity for you and your furry friend to both start to understand one another. The first weeks of bonding are critical, as they are the formative months in a puppy’s life and can help establish rules and behaviors that last throughout their lifetime. With that in mind, there are a few keys to success. As your pup begins to explore and navigate your home and routine, he or she may start to engage in behaviors that you may find undesirable. This may be something as simple as not jumping on the couch or more problematic like using the bathroom on your favorite rug. Instilling into puppies right and wrong behaviors is important, and being consistent with your training is vital to making sure it takes. If you sometimes let your dog on the couch and sometimes don’t, for example, it can be confusing for your four-legged friend. Deter bad behavior consistently and evenly – any missteps will only lead to mixed messages for your dog. Dogs are pack animals, and like animals in a pack, they’re looking to follow a leader. Be the leader in your puppy’s life by acting confidently in your interactions. If you are perceived as weak, your puppy will take advantage, and bad behaviors like chewing, pulling on the leash or barking incessantly are more likely to develop and persist, notes Cesar Milan on his website. Be even-handed and stable in your positive and negative reinforcement and make sure that your pup knows who’s boss. If you already have older pets in the home, introducing your new playmate to your current fur family should be done with grace. Older dogs are often skeptical of puppies, which are often far more playful and energetic – traits that can be seen as annoying to some dogs. To help, tire your puppy out with a long play session or walk before introducing him or her to your elder dog, says Cesar. This helps moderate energy levels and makes your older friend more welcoming. As your canine companions get to know one another, don’t leave them unsupervised; you want to keep your place as the pack leader and make sure that no fights break out between the generations. Making sure that you’re assertive, consistent and provide proper reinforcement or deterrents are the keys to enjoying a long and happy life with your pup. Make sure that when he or she does well or behaves the way you want, you reward your pup with a treat or pet of approval. On the other end, figure out a deterrence strategy that works, and use it sparingly to reinforce verbal commands. With practice – and patience – you’ll have your dog integrated into your family in no time! If you’re looking for a new friend, look no further than Jubilee Labradoodles. Our pups are friendly, healthy and socialized before they leave our Doodle Ranch, making them ready to join your family. 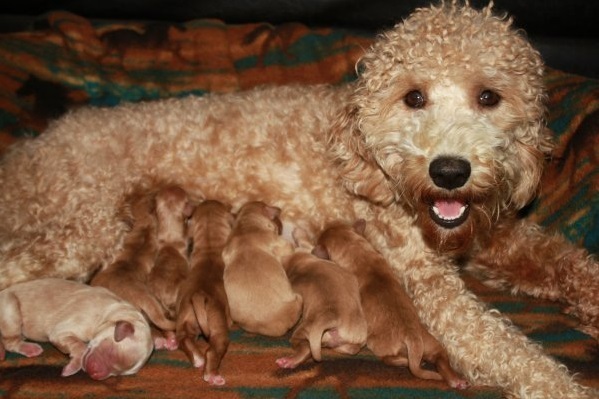 Plus, don’t forget: Labradoodles are the Ultimate Family Pet! Check out the puppies we have currently available, or contact us today for more information on upcoming litters.